China's opening-up offers opportunities for global growth. This was the message from the China Development Forum Special Session held in Beijing Sept. 16-17. With the theme of "A New Chapter for China's Reform and Opening-up," the event hosted global business leaders, Chinese government officials, various experts, as well as representatives of international organizations, to review the changes occurring in the past four decades and discuss future trends. 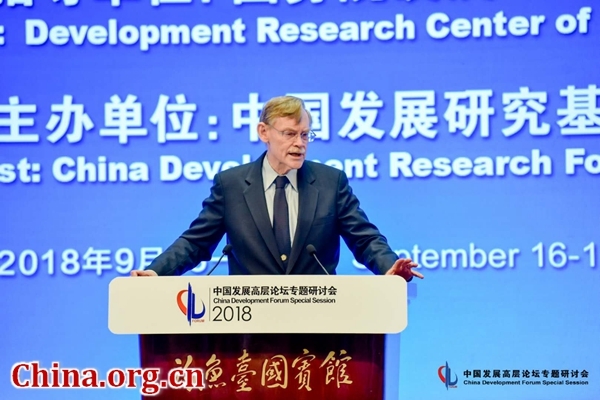 Former World Bank Group President Robert Zoellick, who first visited China in 1980, said that China's accomplishments over the past 40 years had changed the world while changing the country itself. As to trade tensions between China and the U.S., Zoellick said that China's continued reform and opening-up would effectively respond to the criticisms levelled against it and rebuild the confidence of American companies in the Chinese market. He also called on the U.S. business community to move beyond their own worries and cooperate with China to resolve existing tensions. Jochen Goller, president and CEO of BMW Group (China Region), echoed Zoellick's words, saying China's opening-up was bringing opportunities to all the businesses involved. According to Goller, BMW's car deliveries in China last year exceeded the combined figure for the U.S. and Germany, its second and third largest markets. He said the slashing of Chinese tariffs on car imports from 25 percent to 15 percent sent out a clear message to the world on further opening-up, which would mean wider market access for foreign companies. Li Wei, president of China's Development Research Center of the State Council, said the nation had become an important engine driving global growth, with its contribution to the world GDP surpassing 30 percent for many years in succession. "As the world's largest exporter, China provides the global market with goods attractive in both price and quality; and as the second largest importer, China enables the flow of goods across the globe to a market with more than 1 billion consumers," Li added. He said that as the interests of different countries were becoming more interconnected because of deepening economic globalization, China's further opening-up would not only benefit its more than 1.3 billion people, but also contribute to a more robust, balanced, inclusive and sustainable global economy. Participants in the China Development Forum Special Session have agreed China's opening-up offers opportunities for global growth.